Gov. Peter Shumlin maintains he won't focus on his reelection campaign until Labor Day. But after returning from a two-day Democratic Governors Association fundraising event in Connecticut, he's holding a fundraiser for his own campaign tonight at Montpelier's Main Street Grill. In the past week, he's been hitting the phones to ensure a solid turnout. Six registered lobbyists told Seven Days they received an emailed invitation to the event, and four of them said they had received phone calls from the governor himself asking them to attend. Citing the desire to continue doing business in the state, the lobbyists requested anonymity. Shumlin's cold-calling spree comes just weeks after the legislature adjourned for the biennium. Lawmakers are barred from soliciting campaign contributions from registered lobbyists until legislators adjourn "sine die" — or, for the duration of their two-year terms. Since former governor Howard Dean was in office, the legislature has refrained from adjourning sine die for weeks after the session ended, so that its members could return to Montpelier to override a potential gubernatorial veto. But in the closing hours of this year's session, Shumlin's aides struck a deal with lawmakers to adjourn sine die that very day. As a result, Shumlin is now free to hit up those doing business with the state. Erika Wolffing, a former deputy commissioner of labor who now serves as a fundraiser for the DGA and Shumlin's reelection campaign, declined to say whether it was appropriate to raise campaign cash from registered lobbyists. She also wouldn't say whether the governor had insisted on adjourning sine die so that he could start raising money from them. "Information about the Governor's fundraising will be available on his campaign finance report," Wolffing said in an emailed statement. 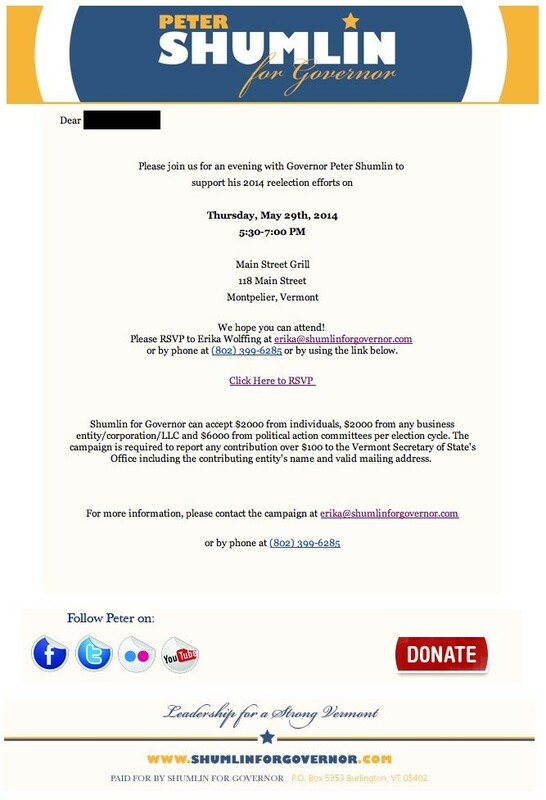 The invitation to Shumlin's Thursday night fundraiser does not spell out how much donors must shell out to attend. It simply says that the governor "can accept $2000 from individuals, $2000 from any business entity/corporation/LLC and $6000 from political action committees per election cycle."